Melt the butter and butter three 15×10 cookie sheets with a basting brush. Reserve the remaining melted butter. In a mixing bowl combine the flour, salt and baking powder. Mix thoroughly. Add 2 tablespoons of the butter to the flour mixture. Add ¼ cup of the water to the mixture and blend it in thoroughly. Add 1 tablespoon water at a time till the mixture forms a ball and the dough comes completely off of the sides of the mixing bowl. Turn the dough out onto a clean floured surface. Knead the dough till it is smooth. Divide the dough into 3 equal balls. Using a rolling pin, roll each ball out into a rectangle to fit the cookie sheet. It needs to be very thin, and it should fill the sheet completely. Once the sheet is cracker size thin, coat the rolling pin with flour. Gently lift one corner of the flattened dough and wrap it around the rolling pin. Transfer the dough to the buttered cookie sheet, then gently unroll the cracker sheet onto the cookie sheet. If the dough is too large for the pan, cut the edges of the dough with a knife until it does. Add the excess dough to one of the remaining dough balls. Sprinkle coarse salt over the cracker sheet. You can use as much or as little as desired. 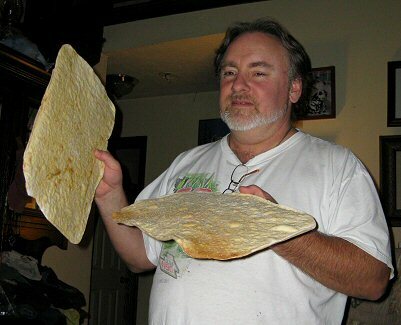 With a pizza cutter, cut the dough while it’s on the sheet into your preferred sized squares. Dot the dough: using a fork. Poke three rows of holes into each cracker. Bake for 8 to 12 minutes till they are lightly browned. 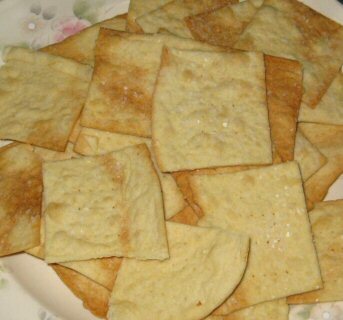 You can make them crisper, by cooking longer, but keep an eye on the crackers so you don’t burn them. Remove the crackers from the oven and let cool for about 10 minutes. Turn the cookie sheet over and allow the crackers to fall from the pan. Then gently break the crackers apart and let cool before storing them in an air tight zip lock bag. You can replace the coarse salt with any variety of seasonings, such as ranch, garlic or whatever your favorite seasoned topping might be.